B.C. 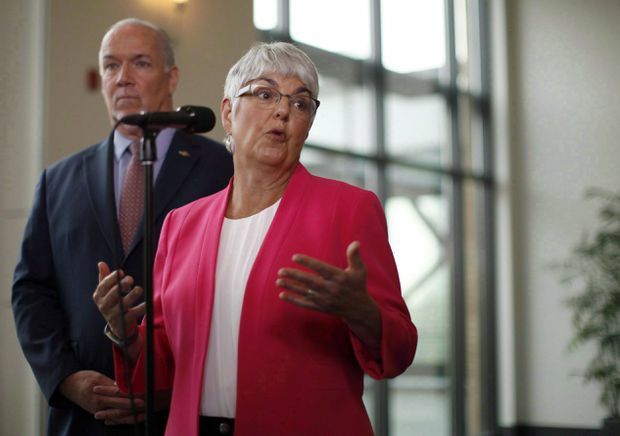 Premier John Horgan looks on as Finance Minister Carole James answers a question during a media scrum in Nanaimo, B.C., on August 22, 2018. Experts applauded the move, saying it puts British Columbia out front in a global movement to crack down on tax evasion and money laundering in the real estate sector. “Based on initial review, we applaud the government of B.C. for putting forward this needed legislation,” James Cohen, executive director of Transparency International Canada, said on Tuesday. The proposed legislation, the Land Owner Transparency Act, would establish a public registry of beneficial owners of property in the province. Corporations, trusts and partnerships that buy land would be required to disclose their beneficial owners in the registry, with failure to disclose resulting in fines of up to $100,000 or 15 per cent of the assessed property value, whichever is greater. The proposed legislation comes amid growing concerns about potential money laundering in real estate and other sectors. Transparency International Canada highlighted Vancouver real estate in a 2016 report, concluding nearly one-third of the 100 most valuable residential properties in Greater Vancouver were owned by shell companies. A Globe investigation published in February, 2018, uncovered how 17 underground lenders had claimed a $47-million stake in more than 40 Vancouver-area properties, allowing people connected to the deadly fentanyl trade to park their unlawful gains in the real estate market. An RCMP intelligence report estimated that up to $1-billion from the proceeds of crime was used to purchase expensive Metro Vancouver homes. A government-commissioned report released last year found extensive money-laundering had taken place in the province’s casinos. Additional reports, on money laundering in the real estate, luxury car and horse-racing sectors, and a separate report on compliance, were delivered to government this month but have not yet been publicly released. “I think the province is actually leading the country,” said Denis Meunier, an anti-money laundering consultant and former director of the Financial Transactions and Reports Analysis Centre of Canada, or FinTRAC, said of B.C. 's proposed legislation. “Sometimes when you have really complex structures, they’re like Russian dolls,” he added, referring to dolls that open up to reveal another doll inside. In an August submission to the province on the draft version of the proposed legislation, the Society of Trust and Estate Practitioners (Canada), or STEP, raised several concerns, including the lack of harmonization with existing regulations and privacy issues. In its submission, STEP said the proposed legislation appeared to have been drafted “with little regard to how it might be made to work in harmony with other relevant legislation,” and said filing ownership information in a public registry could put people at risk. “An individual who lives in, or travels to, or has family who lives in or travels to another country where crimes such as kidnapping are common, may wish to keep details of his or her asset holdings and wealth confidential," the submission said. Registries in other jurisdictions have come up with ways to address such concerns, Mr. Meunier said, such as exemptions that can be granted in certain circumstances. Ron Usher, general counsel at the Society of Notaries Public of British Columbia, said his group welcomes the push for greater transparency but noted there will be an “astounding” amount of work to set up the registry. The most recent federal budget included several measures related to money laundering, including an extra $69-million for the RCMP over the next five years.